I’m happy to hear that RSVPMaker is working well for some people, but I also get a few reports from people who are having problems. Here are some guidelines for resolving any issues you may encounter. 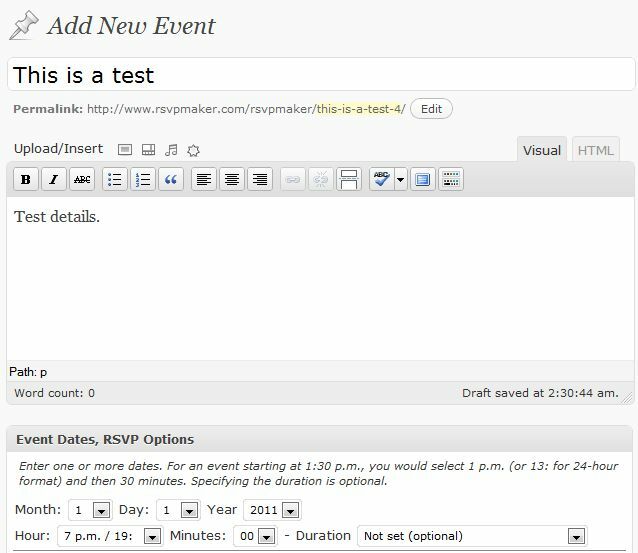 One known (but not completely understood) issue is that some WordPress users report getting “page not found” messages when trying to view an RSVPMaker event or click on the RSVP button. This appears to be a problem with either specific WordPress configurations (multisite?) or interference with other plugins that also manipulate the permalinks setup. If you run into this issue, there is now a “Tweak Permalinks” checkbox you can click on the options / settings page for RSVPMaker. This should clear up the issue (by making WordPress refresh the permalinks more frequently), but let me know if it does not. I’ve also added a “Debug” mode checkbox on the settings page. You should only turn this on if you’re having trouble. 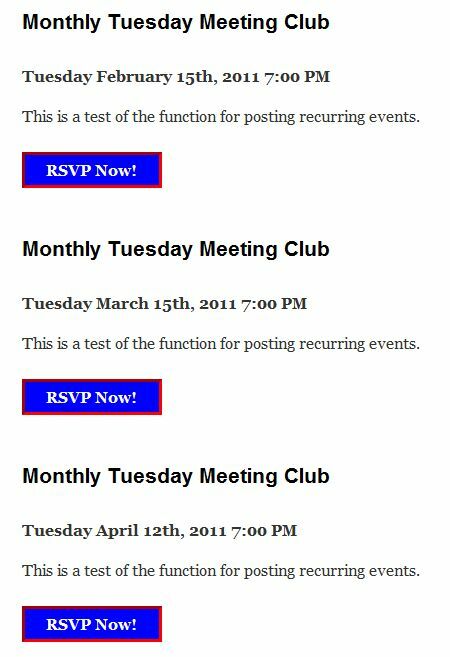 It adds a “Debug” screen to the RSVP Events menu where you can check system variables or share them with me, relaying them to me by email. I hope very few people will have to visit this page, but at least if you are having some sort of trouble it gives me a better chance of figuring out why it is occurring. I’m getting ready to declare RSVPMaker polished enough that it deserves version 1.0 status. Made it easier to edit dates for events previously entered in system. Widget and headlines listing shortcode output now include a link to your event listing page. Previously, if you entered an event and wanted to change the date or time, you had to delete the existing date and enter a new one. Embarrassingly awkward, I know, but it was a detail I hadn’t gotten around to doing anything about until now. First, I had to solve a few programming challenges related to the way dates are calculated. 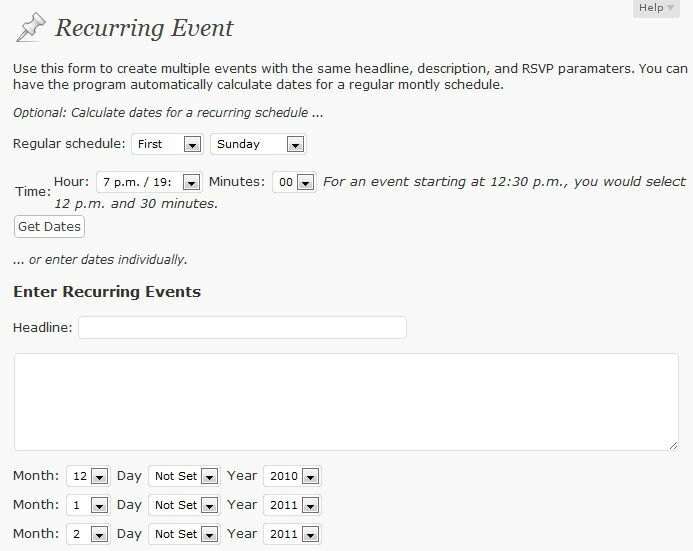 Cleaned up “Event Dates, RSVP Options” box in editor, moving less commonly used parameters to the bottom. Added a Tweak Permalinks setting (a hack for a few users who have reported “page not found” errors, possibly because some other plugin is overwriting the RSVPmaker url rewrite rules). 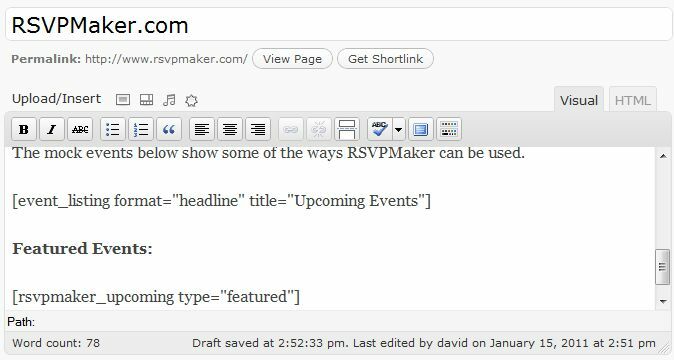 RSVPMaker appears to work just fine with the forthcoming update to WordPress, based on the current release candidate code. The new release should be official very soon, and I’ll be posting and RSVPMaker update with some of the additional features people have been asking for. These are mostly things I got as requests from other people who have tried RSVPMaker and are looking for some extra features. Let me know if these are on your list, or if you see other areas for improvement, so I will know what to prioritize. Ability to set both a start date and a deadline for accepting RSVPs. Currently, I only provide a start date. When soliciting signups for specific timeslots (for example, volunteers at an event), allow variable lengths for the timeslots (currently fixed at one hour). 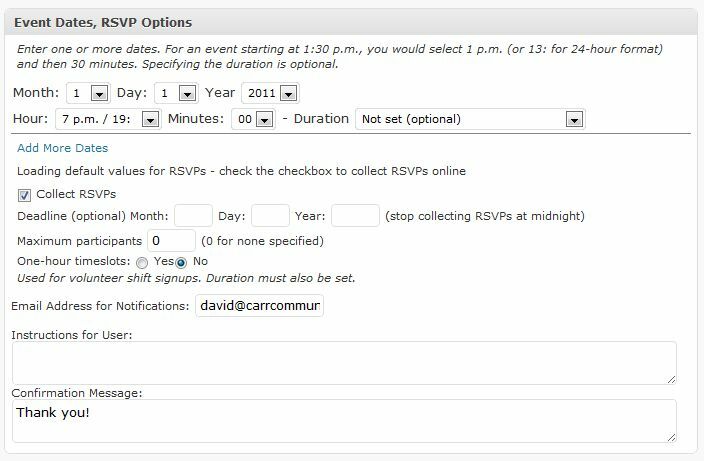 For multi-day events with RSVPs, the option of letting people sign up for one or more days but not necessarily all. So for a 3-day event, we might provide checkbox for those who only want to sign up for two days out of three. Some system for approving RSVPs, where there is some criteria for acceptance. I got this request a few weeks ago but am unsure how it should work, so not giving it a high priority. 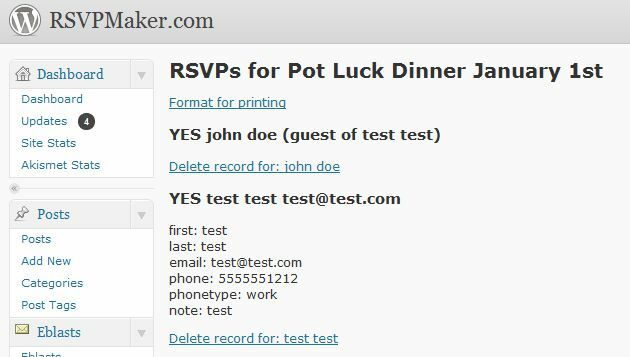 A way to specify different RSVP forms for different event types. Might offer this as a set of cookbook guidelines for people who want to do special customizations, rather than as a core part of the plugin. The trick with addressing some of these requests will be doing so without cluttering things up too much for those whose needs are more basic. I’m planning to move some of the more complicated options that only apply in special cases to a separate section of the control panel for setting RSVP parameters. The event type category I provide isn’t really being used for anything now. I’m thinking that the shortcodes for displaying listings should have a way of designating that you only want to list the events in the featured category or some other category. 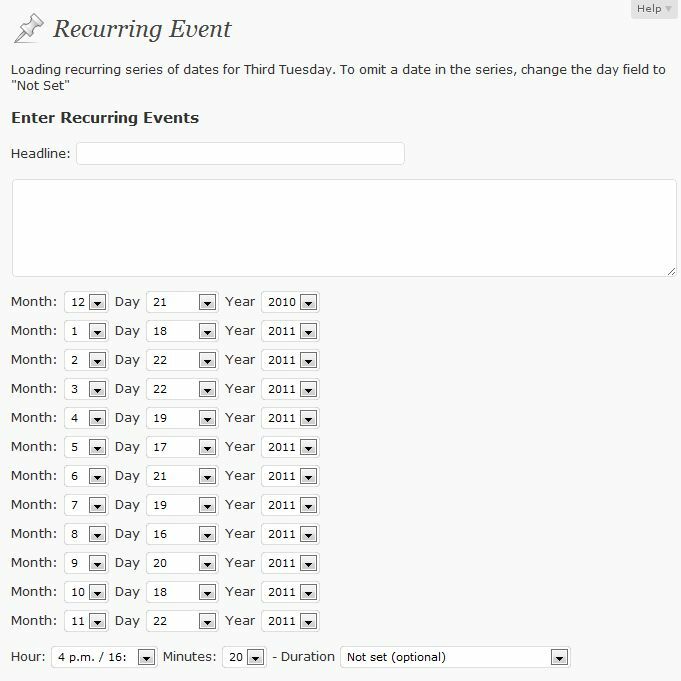 Also want to revise the recurring event editor to let you specify how far ahead you want to project the dates for the events you are setting up. This is a brief illustrated tutorial on the RSVPMaker event editor and the primary options it provides. Here’s how you set up a basic event, with just a headline, event description and date and time set. Here, we’re specifying both a start time and a duration, so that the system will display both a start time and an end time. 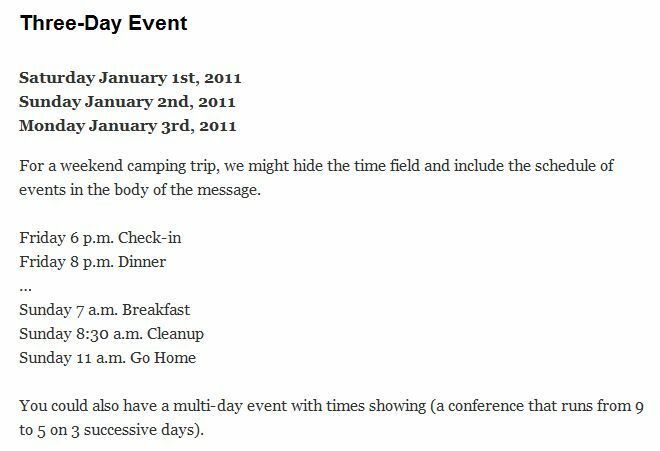 You can also set up a multi-day event with a common headline and description for a weekend camping trip or week-long conference. Setting up a multi-day event. Setting it to hide the display of the time for these all-day events. 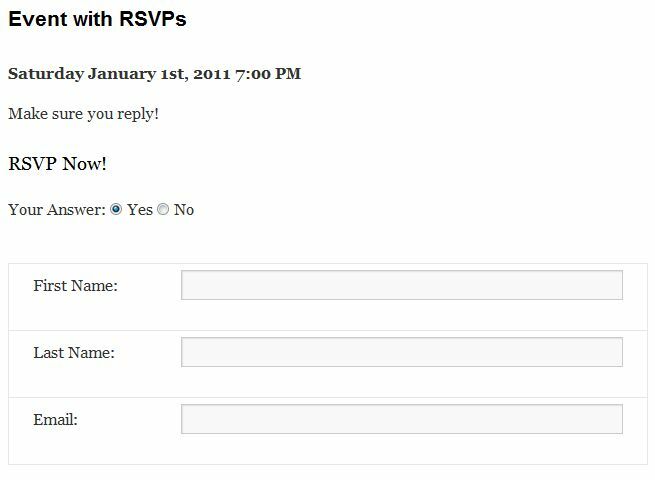 If you want to collect RSVPs, you need to check the Collect RSVPs checkbox and specify an email address for whoever needs to receive notifications when someone completes the form. You can also view a report of everyone who has RSVP’ed. 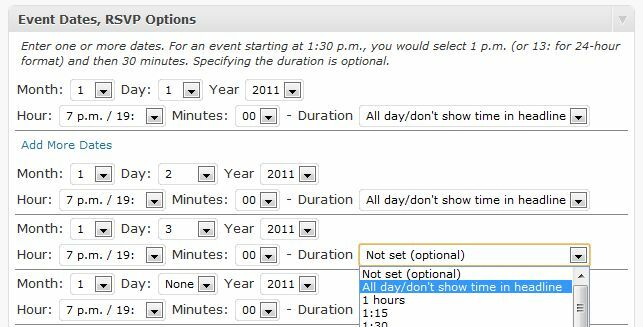 Prompt users to sign up for one-hour timeslots, an option intended for use staffing volunteer events. A future release may allow you to set the time interval for the volunteer timeslots, but right now it’s fixed at one hour. If you view an event listing, you will now see an RSVP Now button at the end of the listing. You can also send out email invitations that include this button to prompt a response (See How to Post and Email an Event, which explains the related ChimpBlast plugin for use with MailChimp email broadcast accounts). 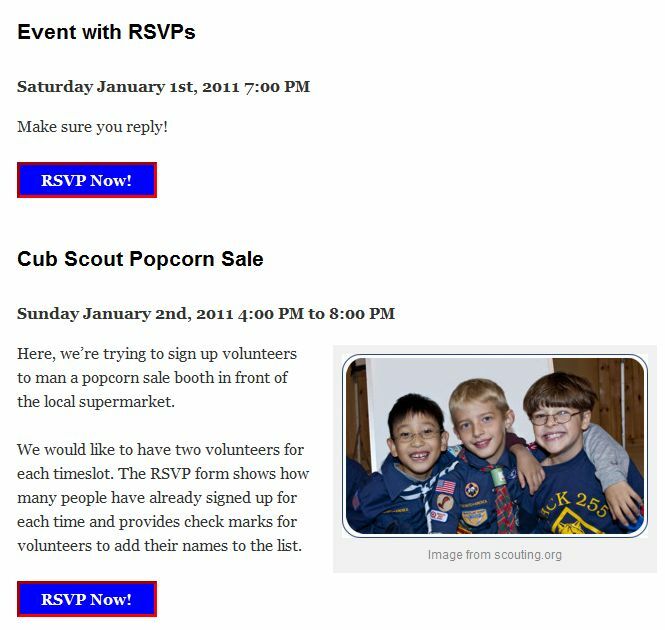 Click the button or the headline, and you’ll be taken to a view of the single event with the RSVP Form displayed. The RSVP editor will also display options for setting prices for online payments if you have PayPal enabled. See How to Set Up PayPal with RSVPMaker for details. 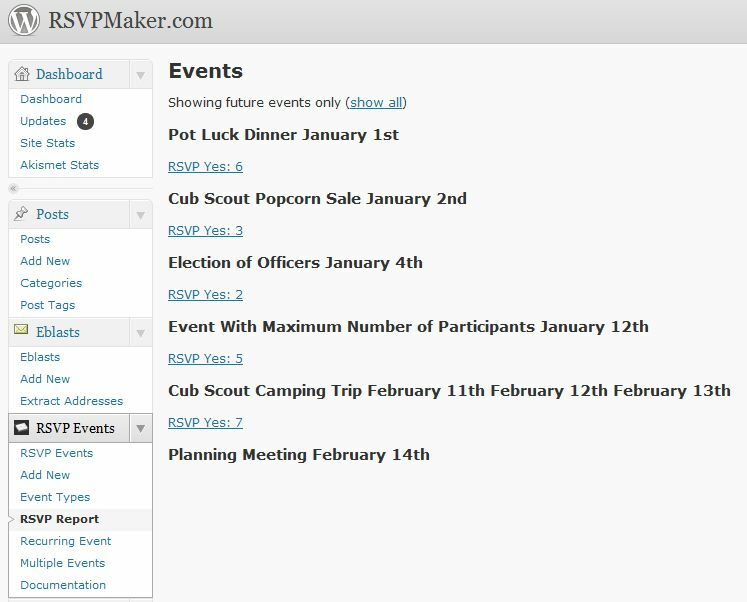 The idea is that you can create a basic event listing for several months into the future, with boilerplate details on your meeting location and other common parameters such as whether an RSVP will be required. You can then go back and edit or update those listings as needed. This alternate editor does not include the rich text editor you get when you edit a single post, but you can include your own HTML in the description body. The RSVP options at the bottom of the screen are the same ones displayed on the main event editor screen. If I make use of the ability to specify a schedule such as “Second Tuesday,” I get a series of dates loaded into the editor. I change the dates as necessary (for example, to account for schedule changes around holidays), enter my details, and submit. I also provide a Multiple Events editor, which is even more basic — just a quick way of editing a bunch of events at once. Again, you can always go back and enhance the listings as needed. I’ve upgraded the RSVP Report to be a little neater, include a function for printing reports, and add an option for deleting entries (including spam entries or test entries). Note the new “Format for Printing” link, which pulls up a version of this report that opens in a new window with no links or WordPress branding / navigation showing. Clicking the delete link under a name brings up a confirmation screen. If there were guests associated with the entry, you’ll be asked if you want to delete them, too. 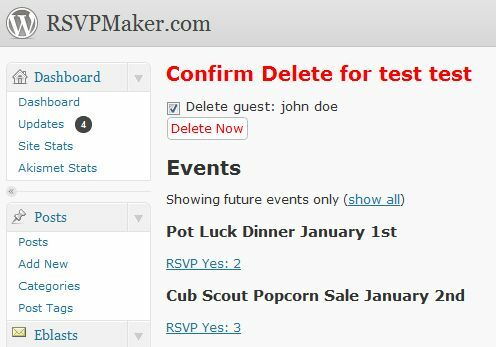 Note: RSVPMaker 2.5 makes more advanced customization of the RSVP form available from within the administration console, which may eliminate the need for some code-level customization. 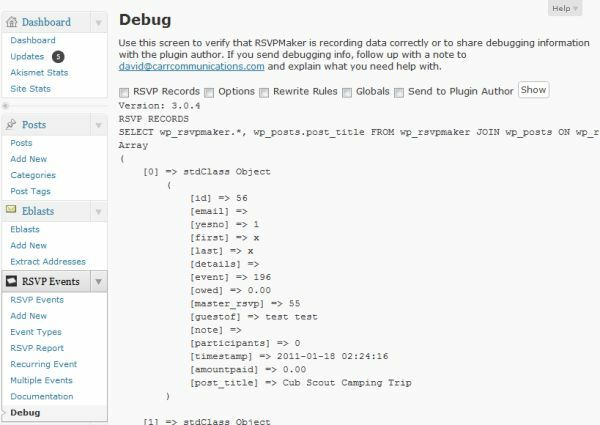 RSVPMaker includes a mechanism for allowing you to add custom functions or override the some of the default functions included with the plugin. Specifically, you can override any of the functions defined in rsvpmaker-plugabble.php. You do this by adding your own rsvpmaker-custom.php file to the plugins directory (the directory above the rsvpmaker folder). My distribution includes a sample rsvpmaker-custom.php file but it will not be activated until you move it to the new location. Essentially, this lets you plug in your own functions within my plugin. The idea is to provide some freedom to customize, without losing the benefit of upgrades to the core rsvpmaker code. More extensive customizations are possible by overriding the event_content function, although this is a longer, more complex function. If you open the rsvpmaker-plugabble.php file, you will see the functions are wrapped with if(!function_exists(‘function_name’) ). If you copy the function definition for event_content into your custom.php file, you will be able to modify the function as necessary for your purposes.